I was fortunate to have the opportunity to visit with American Airlines at JFK airport on Friday afternoon as part of the tour they’re running of their new aircraft livery and get to see it in person. My initial thoughts were relatively neutral. I’m comfortable enough with the logo but the tail turned me off a bit. In our most recent podcast episode we talked about the situation and my comment there was pretty much that it is hard to believe that anyone wants to be seen as a flag carrier these days, particularly from the USA. It just doesn’t make much sense to me in the rapidly shifting global economy. We believe with the name American on the front of the airplane…that we are certainly the flagship to the world for America…. [The tail] is intended to give the view of the flag flying in the air and hopefully we’ve captured that for all of America as these airplanes fly around the world. To be fair, they executed pretty well on that plan, so I have to give them that, but I still question moving in that direction. Putting aside that part of the design, a bit which completely baffles me, I have to say that it really looks much better in person than in the renderings I initially saw. The "ribbon" up front looks better than I expected and the colors work pretty well on the planes, I think. I’ve got some more photos from the event online here, too. Special thanks to the crew at American for being such gracious hosts, including accommodating us at the end of the event with a visit to the roof deck outside the control tower. That was awesome. Finally, they were giving away marketing posters at the event showing a rendering of the new plane flying over some mountains. I grabbed a few, just in case some readers here might want one. Leave a comment indicating such if you do and I’ll figure out a way to give them out. I’d love to have one of those posters! Great news, everyone… American Airlines saw this post and agreed to give out posters to everyone who wants one. You all should have received an email by now with instructions on how to claim it. Let me know if there are any questions. Seth, I don’t need a poster; just to say, thanks for giving away something other than a credit card link. I would love to have one if you have one left! I can’t believe this American company would want to be associated with the US. Perish the thought. There’s a big difference between being an American carrier and pretending to be the Flag Carrier for the USA. HUGE difference. It goes far beyond just being associated with the USA. As for being an idiot, I’ve never disputed that idea and I’ve oft called myself the same. I usually manage to do it with a bit more aplomb though. Thanks for reading. Nick is obviously oblivious to the world outside ‘Merica. I actually like the design. The rebranding reminds me of delta a few yrs ago. I’d love a poster, too! Why wouldn’t they want to be seen as the flag carrier for the US? For someone as well traveled as you are, I’m surprised at how you feel about the world’s perception of the US. My perception is that far more people hold America and Americans in high regard than do not. Anyway, with the name American Airlines, they’d be hard pressed to disassociate themselves with America. While I understand why you might not like the tail design, I’m baffled that your baffled at their choice. BTW, while I appreciate the information on the your site and podcast, you come across as a sniveling, snobby, prat who takes his good fortunes for granted. I won’t be as harsh as Nick but I don’t really understand the aversion to being identified as the US flag carrier either. It’s not like AA is looking to get a bunch of European or Middle East flyers to flock to them in droves. They tend to fly a bunch of Americans to from from places. Considering our market supports the #1 and #2 carriers in the world, it’s not like they’re targeting a small customer base. I think they have their eyes on the flyers of Delta, United, and Southwest and contrary to what the media and a minority in this country would have you believe a lot of us are proud to be associated with the Stars and Stripes. Plus the emerging markets in this world of China and India aren’t exactly places where they’re burning our flag in the streets. I think American was smart to go this direction with their branding. Like yourself, I was neiutral at first but it’s growing on me. Thanks for sharing!! I’d like a poster as well if you have extras. I see little difference between the new AA tail design and the Union Flag motif on British Airways. Both are appropriately symbolic. Great post, looks like you had a good time. Did you get any insight on a possible merger? No discussion at all on a possible merger and no surprise there, really. It’ll happen and when it does we’ll all get the details about the ownership numbers. Until then we’ll just have to wait. I was a bit surprised to hear one marketing guy pining for a tighter relationship with JetBlue, particularly for the Caribbean market. That wasn’t what I expected to hear. As for the flag carrier thing, I really don’t think it is a smart play for any airline in any country. It isn’t often that someone walks up, says “We’re from the government and we’re here to help” and gets a good reaction. I know it isn’t exactly the same but I see many parallels there. Maybe I’m wrong about this and presenting themselves as America’s Flag Carrier is going to lead to great success for AA. I’d be surprised should that happen but it might. And I’ll happily wait to see if that’s so. But from my limited marketing and business experience I know it isn’t the path I’d pursue. As for being “a sniveling, snobby, prat who takes his good fortunes for granted,” I really have no idea where that comes from. I work pretty darn hard to be able to do the traveling I do and to find and share the information I can. I’m not living on a trust fund, shilling for CCs or churning hundreds of thousands of dollars in business spend of someone else’s money on my CCs for personal gain. I work to cover my costs and pay for everything I do out of my own pocket. If saying I disagree with a marketing decision by a company I cover makes me a brat then guilty as charged, I guess, though I’d question the parameters being used to judge there. Great photos- thanks for posting. I would also love a poster! Love the site! I enjoyed meeting you at the United DO back in November. Would love a poster as well. Thanks! Thanks for sharing. I’d love a poster! Interesting to ‘see’ the jingoism exhibited here by some. Most who have not traveled outside of their home state….let alone traveled the world recently. Some years ago America and its sons & daughters were respected around the world, today not so much. Sadly, the ‘tail’ may produce more of a target, than an expression of patriotism …. I’ll request a poster as well, if any are left. I’d quite like a poster as well 🙂 Although I’m probably too late. 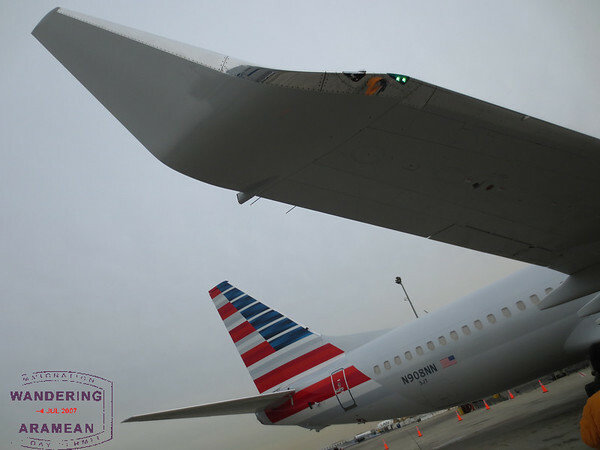 Regardless of whether AA wants to position themselves as a flag carrier, the flag needs to look elegant – in its current form, it looks like some ugly streaks of paint. I just hope it looks better in person than in the photos. The rest of the livery is nice though. If you have any left, I’d like a poster. Will be staying downtown NYC this week, if it helps. I have to say that the livery does look better in photos than in renderings. I really like the new logo and the paint looks great. The tail still kills me though, and not in a good way. Well they appear to be trying and I hope they stay as they are and do not merge with US Scare. I will take a poster if you still have any left. how can I get one of those posters?? Sorry, Dave; the posters are all accounted for now.